On the table this morning, will be my very own home-made Oat Milk! I really enjoy Oat Milk as compared to conventional cow’s milk and the benefits list goes on. It’s have many healing properties and are best known for their high protein and packed with minerals and vitamins, high in natural fiber, lactose-free, low fat and calcium rich! Oats can enhance the immune system, prevent cardiovascular diseases, maintain healthy cholesterol and blood sugar levels, provide strength and energy from natural plant proteins and sugars, and improve the health of your skin and hair! Oats are easily available everywhere in Singapore and considered an extremely health-conscious choice. Therefore, switching to oat milk is a preferable option if you are looking to lose weight. Moreover, it’s SIMPLE to do-it-yourself! And you don’t have to worry about additional additives being added in to your own DIY milk, as compared to other commercial brands. Also by customizing, you can fine tune your Oat Milk to your own liking! Simply because you will have complete control over the texture of milk and flavor. 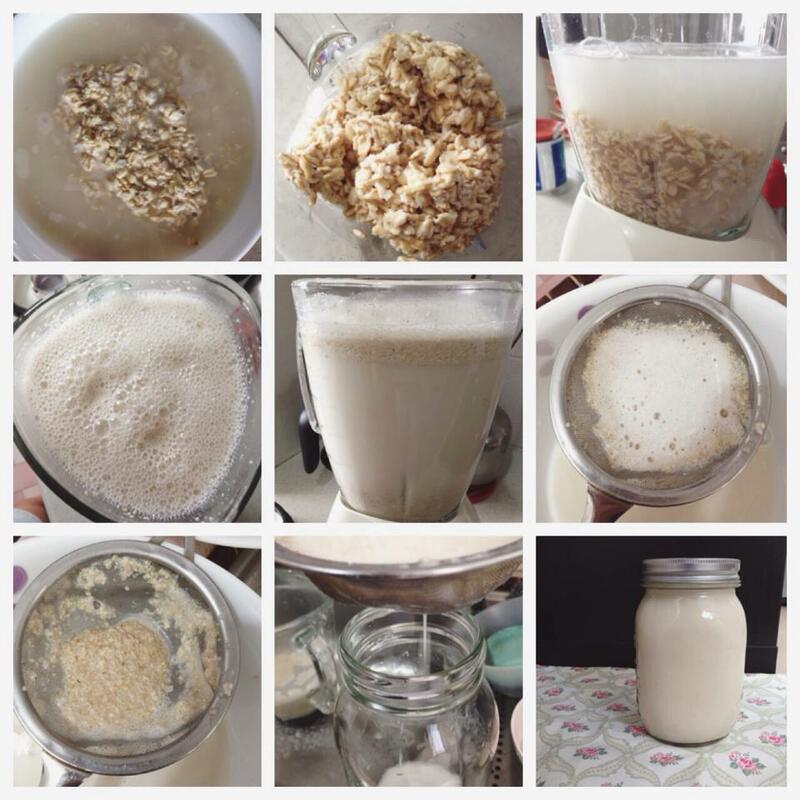 Just 9 simple steps within minutes and you will get your very own Oat Milk! Step 1: Rinse and drain 1 cup of rolled oats. Place oats into a bowl and cover with water. Soak for around 20 minutes or longer (even overnight) if desired. Not only does soaking help soften the oats, but it also removes extra starch and makes them easier to digest. Step 2: After soaking, rinse and drain the oats very well. This step is very crucial as removing oat slime from soaked oats determines the texture of the after-product. Step 3: Scoop all the oats into your blender and add 3 cups water. You may customized it by adding more or lesser water, depending on your preference. Step 4: Turn the blender on a low speed and increase the speed gradually. Step 5: Blend it for about 15 – 20 seconds; do not blend till oats are pulverized. Step 6: Sieve the blended oat milk and use a spoon to gently push down on the oat pulp so the milk flows through. Step 8: Repeat sieving the milk if necessary. Step 9: Almost there! You may add in your mix-ins after the final sieving and blend it for 3 seconds. The flavour of this oat milk tastes like oats and I love it! The texture of the milk tastes exactly like the one bought in store! I really enjoy customizing the taste to suit my own taste-bud. The texture, the sweetness and the additional mix-in! You may even add in raw chocolate nibs to make a Chocolate Oat Milk! This should last in the fridge in a sealed container for 4-5 days. You may use it in fruits smoothies, cereal, baking, or drink it straight from the jar. For me, I love dunking my wholemeal bread in it and have it for breakfast! Simple and on-the-go! 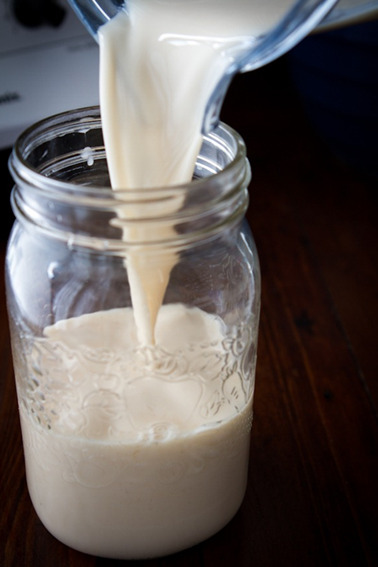 Note: Homemade milk does separate, as it is free of emulsifiers and thickeners, so be sure to shake or stir your milk before drinking it.